Underground coal gasification - the conversion of in-seam coal to a useable syngas of medium calorific value for heat and power generation - has been demonstrated at pilot stage in more than 60 locations throughout the world. Commercial power plants in the Former Soviet Union (FSU) were fired by UCG syngas over 40 years ago, and one in Uzbekistan is still in operation. The advantages of UCG are the large power (20-40 MWt) produced per borehole, the controllability of output from full to low load, as required, and the use of the gaseous fuel in highly efficient combined cycle gas turbines. No underground working is required; coal washing and waste piles are eliminated at the surface, and the process uses only indigenous coal, with no import costs. The technology of UCG has advanced considerably since the first commercial power projects in the FSU of the 1960s. Directional drilling, now very accurate, provides access to coal seams and allows the construction of horizontal and branched well configurations to maximise extraction efficiency. Moveable injection, first developed in the early US trials and known as CRIP (controlled retraction injection point), creates a sweeping action along the borehole, Figure 2, which permits precise control of the burn front and maximum coal utilisation. Furthermore, no fracturing of the strata or coal is involved and the water table is virtually undisturbed. Horizontal drilling technology also allows offshore and estuary coal to be drilled from land, thereby eliminating the need to construct offshore drilling platforms. "The absence, so far, of a fully operational commercial plant using up-to date UCG technology anywhere in the world, is a contributing factor to the lack of investor confidence"
There are, however, technical and commercial risks for UCG. First, site selection and particularly the depth of coal seam and surrounding geology and hydrogeology are vitally important and must be assessed thoroughly, at significant cost. Second, the underground process during ignition, gas production and decommissioning of the cavity needs to be fully controlled. Third, public perception and environmental impact are decisive in the permitting process for UCG. Finally, the economics of production and utilisation of the gas must be thoroughly understood. The absence, so far, of a fully operational commercial plant using up-to date UCG technology anywhere in the world, is a contributing factor to the lack of investor confidence and the slower uptake of UCG in the current economic climate. The revival of UCG, which started with the European trial of the 1990s, and continued mainly in Australia in the 2000s, coincided with the increase in environmental awareness, the introduction of much tougher requirements for ground and surface water protection and the threat of global warming from fossil fuel emissions. The renewed interest in ground water focussed attention on an early UCG trial at Hoe Creek, Wyoming (1978), where ground water was contaminated due largely to the limited depth (65 m) and the poor pressure control. The European trial in the 1990s, at 550 m depth, showed no such ground water contamination, but another project at Kingaroy, Australia in 2008 suffered from a minor release of benzene apparently caused by a well joint failure, although this is still disputed by the Company involved. The Kingaroy episode led to a three-year freeze on the commercial development of UCG in Queensland, but a recent independent scientific report commissioned by the state government cautiously welcomed commercial UCG in Queensland subject to rigorous risk analysis, government monitoring and a demonstration of successful decommissioning of operating UCG wells at Chinchilla and Bloodwood Creek. While the decommissioning demonstration is now underway, the two companies involved, are engaged in extensive overseas UCG activity (see below) and are critical of the protracted delay in UCG permitting by the Queensland government. The authorities in other countries have taken a more proactive and positive approach to UCG. For instance, in Alberta, Canada, the Energy Resources Conservation Board, in response to commercial interest from coal companies and a fully operating pilot project at Swan Hills, has recently changed its coal conservation act, the oil and gas conservation act, and the pipeline act, to include provisions for experimental and commercial UCG and their measurement and reporting requirements. The acts impose rigorous surveillance and enforcement procedures to ensure compliance with regulations by teams of inspectors, monthly production reporting and quarterly and annual reports. The state of Wyoming, USA, where many of the US tests were undertaken in the 1980s, is currently assessing an application by Linc Energy of Australia, to undertake a pilot test and, if successful, construct a gas-to-liquid to plant in its licence area in NE Wyoming. The Wyoming Environmental Quality Council, after carefully considering all objections, has given a state research and development licence to drill the test wells. The US Environmental Protection Agency, which now must consider the project under the federal safe drinking water law, is the final stage in the approval process of the testing phase. South Africa has increasingly become the focus for commercial UCG, driven largely by the shortage of power and the widespread availability of coal. The state power company Eskom and the petrochemical giant Sasol announced in June 2013 the formation of a one billion Rand (US$97 million) joint UCG development programme to commercialise UCG in South Africa. It builds on a ten-year test programme by Eskom (Figure 3), which has included sixty-six months of UCG pilot testing, the commissioning of a syngas pipeline and the co-firing of UCG syngas at Majuba power station. "South Africa has increasingly become the focus for commercial UCG, driven largely by the shortage of power and the widespread availability of coal"
The Eskom work has also addressed syngas clean-up and water treatment and a FEED study for 140 MW scheme with pipeline at the Majuba power plant is underway. Independently of the Eskom programme, the African coal mining company, Exxaro Resources, has agreed terms for a A$30 million licence to employ Linc Energy UCG technology for sub-Saharan commercial UCG projects, the first being a power project targeted for 2017. Also in the region, Africary Holdings (Pty) Ltd has obtained rights to develop the Theunissen coal resource in the Free State province of South Africa and has agreed with an international power plant operator to construct a 60 MWe power station on the coal field. South African legislation requires that an environmental impact assessment and an environmental management plan be filed, and the proposed UCG project will also require a water use and atmospheric emissions licence. In Europe, Poland has a national project to test a UCG pilot in the Upper Silesian Basin and to produce an industrial plant design by 2015. Poland also continues to co-ordinate the HUGE2 (Hydrogen Underground Gasification Europe 2) project, supported by the EU Research Fund for Coal and Steel. This €2 million project includes a gasification test at the Polish experimental Barbara mine (now complete), further investigations into hydrogen production from UCG, safety studies and research on control of ground water contamination by reactive barriers. Linc Energy is also engaged with the Polish government, with an exploration site licence in the Silesian Basin. UK companies and universities are currently involved in development projects in Poland and Bulgaria to apply oil and gas technology (in the seismic, directional drilling and advanced modelling areas) to UCG to improve control and reduce carbon dioxide emissions. In addition, a variety of companies have taken up the challenge of UCG in the UK, and London also hosts the UCG Association annual conferences, training courses and worldwide information service on UCG.Furthermore, the UK Coal Authority leads other countries on the licensing of UCG and has issued 24 provisional exploration licences for UCG in estuaries and offshore coalfields since 2008 in places as diverse as the Firth of Forth, the Humber and Swansea Bay. The Welsh government and the north east region continue to support UCG development in their areas. UCG is in a position to make a major contribution to Britain's energy supply, bringing security of supply, high efficiency combined cycle gas turbine generation and virtual independence from overseas suppliers of fuel or technology. UCG is the coal technology with the greatest scope to reduce and eliminate carbon from the fuel gas. The high pressure syngas reaching the surface can be decarbonised, partially or completely, by shift and acid removal processes (all well proven technologies) in pre-combustion process plant, which is smaller, more efficient and less costly than the competing processes for natural gas and conventional coal. The resultant pipeline CO2 is then available for underground storage or use in enhanced oil recovery, for example, in the North Sea. Combined cycle gas turbines work efficiently (>50%) with medium-calorific value UCG syngas (hydrogen, methane and carbon monoxide) and in the future, stationary fuel cells, operating on hydrogen-rich gas offer the possibility of Carnot level efficiencies. "Research into UCG-CCS, is pointing to some interesting and novel approaches to achieve the same low carbon result. One of these is the option of storing CO2 in the abandoned cavity"
In addition, research into UCG-CCS, is pointing to some interesting and novel approaches to achieve the same low carbon result. One of these is the option of storing CO2 in the abandoned cavity. 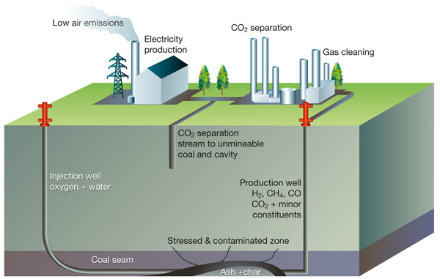 An EU supported modelling and economic study of UCG-CCS in a deep coal deposit in Bulgaria has shown that deep coal seams (>1200 m depth) can permanently store 20-25% of the CO2 produced in the cavity alone, and more in the surrounding stressed strata. Other research work suggests that much greater volumes of CO2 can be stored if the stressed areas around the cavity, Figure 4, are taken into account. Storage costs for the direct storage of CO2 are low because the UCG process and monitoring boreholes are reused and CO2 transportation costs are virtually eliminated. Geological and hydrogeological modelling by Bulgarian and UK scientists have shown that stress fields, contamination pathways and subsidence can be satisfactorily evaluated, and that the UCG and CO2 injection processes will be contained within the strata. A new €4.1 million study known as TOPS (Technology Options for Coupled Underground Coal Gasification and CO2 Capture and Storage) was approved in June 2013 under the final round of the EU Framework 7 programme. The project, led by Imperial College London, with extensive industrial and international support, aims to address reactor zone CO2 storage and develop generic UCG-CCS site characterisations and consider different end-uses of the produced synthetic gas, covering options beyond power generation. Another exciting area, with application to UCG, is the oxy-firing of gas fired turbines, described as a potential game changer because only power, water and compressed CO2 ready for storage are produced from the cycle. The UK winner of a prestigious Russian global energy prize, Rodney Allam, and some big companies like Toshiba and the US based Exelon are engaged in the prototype development. UCG is currently making significant strides towards commercialisation on three continents. Africa is currently leading, with over US$100 million committed to three major power projects in South Africa, while Europe and North America are not far behind. Ground water protection and public perception are the key issues for the non-fraccing UCG process, which now uses advanced drilling and control methods from the oil and gas industry as the its enabling technology. UCG research is now focussed on CCS opportunities and the reuse of process wells for the permanent storage of CO2.